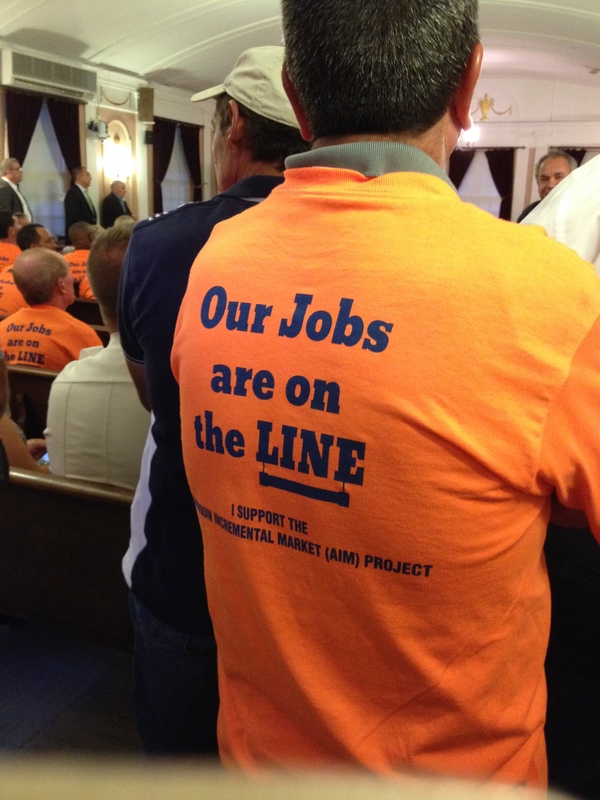 Getting political is something I usually steer clear of but last night, there was a Peekskill Common Council meeting to discuss the Algonquin Incremental Market (AIM) Project. The AIM expansion includes addition of a 42” diameter, high pressure pipeline to the three already existing pipelines that cross under the Hudson River from Rockland County, New York and enter Westchester County. The new pipeline would intersect underground with proposed high voltage power lines in close proximity to the Indian Point nuclear power plant’s 40 years of spent nuclear fuel rods and the Ramapo and Stamford fault lines. Its route continues through Westchester and Putnam Counties, NY and into Connecticut, Rhode Island and Massachusetts. The AIM project also includes expanded gas compressor stations in Stony Point and Southeast, NY, Oxford, Cromwell and Chaplin, CT, and Burrillville, RI. Spectra discussed plans for the pipeline it wants to place under the Hudson River and through Northern Westchester, and attendees had a chance to speak afterward. Usually, turnout at council meetings is sparse, but this one was jam packed. A number of attendees were there out of real concern for the safety and welfare of the area, but what stood out was the sea of orange tee-shirts filling the room. 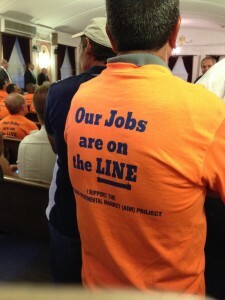 Groups had organized to show their support for the line, as they feel this would provide them jobs. One thing that stuck out to me is that Spectra admittedly said they hadn’t issued any requests for proposals yet, and do not know what contractors would eventually be awarded the job, whether it would be contractors from the area or from other locations, how many jobs it would create, and for how long these jobs would last. This orange-clad sea of people is already pro-pipeline without knowing what the terms of the deal would be. Another thing that stuck out was not a single orange-clad person came up to speak or plead their case, except for an occasional heckler on the sidelines of the audience. Some of the pipeline supporters couldn’t even be bothered to don the orange shirt to show their support, opting to drape it bunched up over their shoulders, which just goes to show how deep their concern and support goes. Around 9 P.M. someone who was not dressed in orange came to the doorway and gave a wave as a sign for his group to go. A cluster of orange headed to the door, and what came to mind was a puppet on a string (or in this case a LINE). In addition to none of them speaking, not a single orange shirt remained as others voiced their concerns. If they had a true interest or concern about the project, you’d think someone would see it through to the end. I even wonder how many of those orange attendees even knew why they were there, besides this being a chance to make a few bucks. The orange tee-shirts boasted “jobs being on the line”, but what was really on the line was that orange audience with someone pulling their strings.